Objective To determine the efficacy of a 23-valent pneumococcal polysaccharide vaccine in people at high risk of pneumococcal pneumonia. Design Prospective, randomised, placebo controlled double blind study. Setting Nursing homes in Japan. Participants 1006 nursing home residents. Interventions Participants were randomly allocated to either 23-valent pneumococcal polysaccharide vaccine (n=502) or placebo (n=504). Main outcome measures The primary end points were the incidence of all cause pneumonia and pneumococcal pneumonia. Secondary end points were deaths from pneumococcal pneumonia, all cause pneumonia, and other causes. Results Pneumonia occurred in 63 (12.5%) participants in the vaccine group and 104 (20.6%) in the placebo group. Pneumococcal pneumonia was diagnosed in 14 (2.8%) participants in the vaccine group and 37 (7.3%) in the placebo group (P<0.001). All cause pneumonia and pneumococcal pneumonia were significantly more frequent in the placebo group than in the vaccine group: incidence per 1000 person years 55 v 91 (P<0.0006) and 12 v 32 (P<0.001), respectively. Death from pneumococcal pneumonia was significantly higher in the placebo group than in the vaccine group (35.1% (13/37) v 0% (0/14), P<0.01). The death rate from all cause pneumonia (vaccine group 20.6% (13/63) v placebo group 25.0% (26/104), P=0.5) and from other causes (vaccine group 17.7% (89/502) v placebo group (80/504) 15.9%, P=0.4) did not differ between the two study groups. Conclusion The 23-valent pneumococcal polysaccharide vaccine prevented pneumococcal pneumonia and reduced mortality from pneumococcal pneumonia in nursing home residents. Trial registration Japan Medical Association Center for Clinical Trials JMA-IIA00024. Although levels of pneumonia related morbidity and mortality are high among residents of nursing homes, with Streptococcus pneumoniae being the most common pathogen,1 2 3 the vaccination rate with the 23-valent pneumococcal polysaccharide vaccine is low.4 Outbreaks of pneumococcal infection in nursing homes have been reported when the vaccination rate is less than 5%.5 6 7 One possible reason for the low vaccination rate is the lack of clear evidence showing the efficacy of the 23-valent pneumococcal polysaccharide vaccine in nursing home residents, despite the fact that it is generally recommended to those at high risk of pneumococcal pneumonia.8 Most evidence for the vaccine’s efficacy is based on data from community acquired pneumonia, in which large cohort trials, case-control studies, and meta-analyses showed protection from invasive pneumococcal disease.9 10 11 12 13 14 However, no data have been reported on the efficacy of the 23-valent pneumococcal polysaccharide vaccine in nursing home residents. No national recommendation for vaccination against pneumococcal pneumonia exists in Japan, and thus only 3% of the older population (>65 years) had been vaccinated in 2006, the year our trial began. A vaccine proved to be effective would have an important impact on clinical outcome and the cost of health care. We carried out a prospective, multicentre, double blind, randomised and placebo controlled trial to assess the efficacy of 23-valent pneumococcal polysaccharide vaccine on pneumococcal pneumonia and all cause pneumonia in nursing home residents. Nine hospitals and 23 hospital affiliated nursing homes collaborated in this study. We randomly assigned participants to receive either 0.5 ml (25 μg in each) 23-valent pneumococcal polysaccharide vaccine (Pneumovax, Merck, NJ) or 0.5 ml placebo (sodium chloride) intramuscularly, in a double blind, multicentre study. Vaccine and placebo were presented in identical single dose syringe and needle combinations, labelled with sequential study numbers only. A statistician who was not on the study team carried out the randomisation using a random number table, and numbered the containers. A member of staff at Mie University Hospital evaluated participants for eligibility to the study. Participants were assigned to their group by blinded staff at the nursing homes. The code was disclosed to the study investigators only at the end of follow-up. Written informed consent was obtained from the participants or their next of kin. Participants were included in the study from 8 March 2006 to 25 January 2007, and the observation period ended on 31 March 2009. All participants were therefore followed-up for at least 26 months. Nursing home residents were enrolled in the study once eligibility had been ascertained. We excluded people who were immunocompromised, because of a presumed poor response to the vaccine (for example, patients with myeloma, active malignant disease, a neutrophil count <1.0×109/l, hypogammmaglobulinaemia, HIV infection, solid organ or bone marrow transplantation, or those undergoing dialysis); people of potentially low compliance, such as those unable to follow study instructions; people who had ever received a pneumococcal vaccine; and people with hypersensitivity to the vaccine components. Before entry into the study, the resident’s history was taken, including underlying disease, as well as information on smoking and alcohol consumption. A physical examination was carried out and a blood sample obtained before vaccination, after two months, and at the end of the follow-up period. The medical staff who took care of the participants reported any symptoms to the study team investigators. To avoid missing any cases of pneumonia, the investigator in charge ensured that the participants received a medical examination at the nursing home once weekly. If pneumonia was suspected the participant was assessed at the affiliated hospital; the medical staff at the nursing homes also informed the study coordinator of the occurrence of pneumonia or any other disease. Pneumonia was diagnosed by the medical staff of the respiratory unit at the affiliated hospital on the basis of the presence of clinical symptoms and a new infiltrate on chest radiography. Pneumococcal pneumonia was diagnosed from a positive result in blood culture, pleural fluid, or sputum (107 colony forming units per millilitre in a purulent sample) or a positive pneumococcal antigen test result in urine. During the study, the participants, their family, or the medical staff in charge were asked to contact the doctor locally responsible for the study if the participant had any symptoms consistent with a respiratory tract infection. If pneumonia was clinically suspected then chest radiography was carried out in the affiliated clinic or hospital. The radiograph was evaluated by an independent reader, and in most cases (70%) chest computed tomography was carried out for diagnostic confirmation. If pneumonia was confirmed, two samples of blood, sputum, and urine were taken for microbiological examination. Only Gram stained sputum samples displaying more than 25 leucocytes in a high power microscopic field and fewer than 10 epithelial cells in a high power microscopic field were used as diagnostic tools. The results obtained with the pneumococcal antigen detection kit (BinaxNOW S pneumoniae; Binax, NJ) were read at 15 minutes, as recommended by the manufacturer. Cultures were quantified and expressed as colony forming units per millilitre. At all routine follow-up visits and in monthly discussions with the participants or their family members as well as the medical staff in charge, we ascertained whether the participants had been treated for pneumonia or other diseases. If so, we requested the medical record to ensure that we had not missed a case of pneumonia. Because nursing home residents are cared for by medical staff they are better protected from the adverse events of vaccination and easier to follow than older people living in the community. In addition, vaccine efficacy in a double blind, randomised and placebo controlled trial was judged to be statistically evaluable on the basis of previous findings.2 If vaccine efficacy was shown, the clinical and social implications would be important. The study was therefore considered ethically justified and approved by the Mie University review board. All participants fulfilled the criteria of safety required for vaccine injection. No serious side effect occurred after vaccination. At the end of the observation period (31 March 2009) the safety and efficacy committee reviewed the unblinded data, found a significant difference in the primary end points with a sufficient number of events, and declared the termination of the study. The primary end points were pneumonia and pneumococcal pneumonia. The secondary end points were deaths from pneumococcal pneumonia, all causes, and other causes. Exposure time was defined as the time from vaccination to the end of follow-up, or until the occurrence of a primary or secondary end point, or the allocation sequence was disclosed during follow-up for reasons other than a primary or secondary end point. Sample size and power calculations were based on reported morbidity from pneumococcal pneumonia in nursing homes in rural Japan.2 On the basis of the results from this study, we set a follow-up period of up to three years. This would allow us to show a protective effect of pneumococcal vaccine of about 50%, with a power of 80% and a statistical significance of <5%, with a total number of 700 participants, 43 (12.21%) cases of pneumococcal pneumonia, and a placebo group of 350 participants. Data were expressed as means (standard deviations) and analysed using StatView software. In univariate analysis we used the χ2 test or Fisher’s exact test for categorical data and the Mann-Whitney U test for continuous variables. Logistic regression was used to estimate the effectiveness of the vaccine in preventing pneumococcal pneumonia, non-pneumococcal pneumonia, and all cause pneumonia. We used Kaplan-Meier methods to calculate the survival curves. The log rank test was used for time to event analyses and Cox regression to calculate hazard ratios. P values are two tailed. We considered a P value of <0.05 to be statistically different. Overall, 428 of 1434 (29.8%) eligible participants reviewed in the 23 nursing homes were excluded (fig 1⇓). Of the remaining 1006 participants, 502 were randomised to the 23-valent pneumococcal polysaccharide vaccine and 504 to placebo. Table 1⇓ shows the baseline characteristics of the two groups. The exposure time was 1140 person years (mean 2.27 person years) in the vaccine group and 1149 (2.28) in the placebo group (fig 1⇓). During follow-up, one episode of pneumonia was diagnosed in 167 of the 1006 participants (16.6%), with 141 requiring admission to hospital (52 from the vaccine group, 89 from the placebo group). Although some of the participants had multiple episodes of pneumonia (18 had two and three had three), only the first episode was counted for statistical analysis. The incidence of pneumonia did not differ significantly among the 23 nursing homes, and none reported an outbreak of pneumonia. Results were obtained from blood culture for 122 participants, sputum culture for 134, and urinary antigen test for 152. All cause pneumonia was diagnosed in 12.5% (63/502) of participants in the vaccine group and 20.6% (104/504) in the placebo group. Pneumococcal pneumonia was diagnosed in 51 participants (49 at the first episode and two at recurrences); of these, 49 cases were diagnosed by urinary antigen test, 41 were additionally diagnosed by sputum culture, and three by blood culture. In 97 of the 167 participants with pneumonia a full set of tests (sputum and blood cultures and urinary antigen test) was carried out. Causative pathogens were identified in 84 (50%) of the 167 participants. The causative agents of some non-pneumococcal pneumonia were Staphylococcus aureus (10/116, 9%), Enterobacteriaceae (8/116, 7%), Haemophilus influenzae (5/116, 4%), and Pseudomonas aeruginosa (3/116, 3%). Pneumococcal pneumonia and all cause pneumonia were significantly more frequent in the placebo group than in the vaccine group during follow-up. Pneumococcal pneumonia was diagnosed in 2.8% (14/502) of participants in the vaccine group and 7.3% (37/504) in the placebo group. Invasive pneumococcal pneumonia (positive result on blood culture) was diagnosed in 0% of participants in the vaccine group and 0.6% (n=3) in the placebo group. Non-pneumococcal pneumonia was diagnosed in 9.8% (n=49) participants in the vaccine group and 13.3% (n=67) in the placebo group. In the vaccine group the incidence of pneumococcal pneumonia per 1000 person years was reduced by 63.8% and all cause pneumonia by 44.8% (table 2⇓). 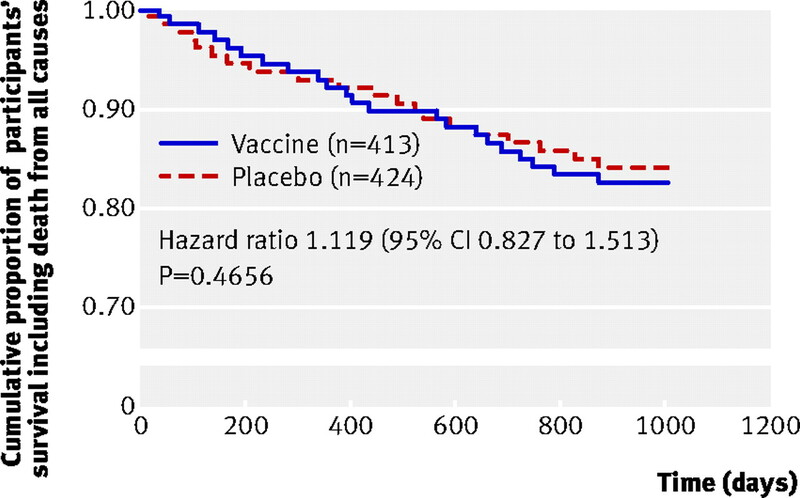 Survival curves in the vaccine group compared with the placebo group showed a significantly increased cumulative proportion of participants without pneumococcal pneumonia (fig 2⇓) and all cause pneumonia (fig 3⇓). 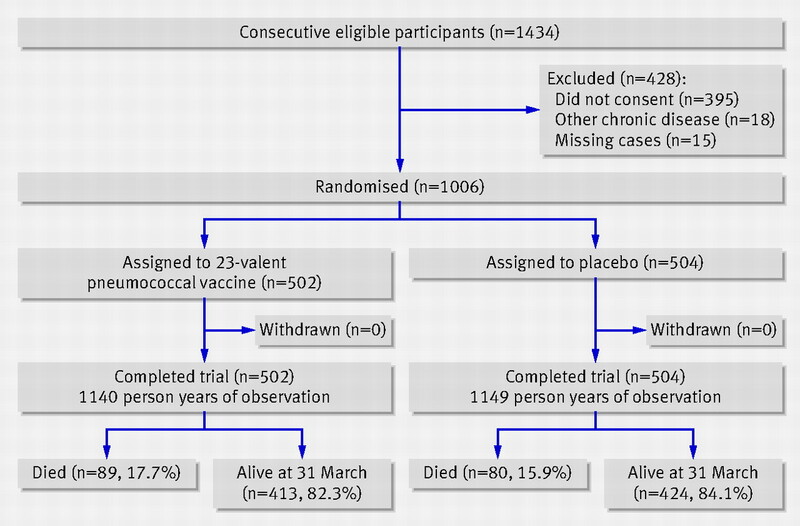 Significantly more participants with pneumococcal pneumonia died in the placebo group than in the vaccine group: 35.1% (13/37) v 0% (0/14) (table 3⇓). The death rate for all cause pneumonia and non-pneumococcal pneumonia was the same in both groups (table 3). 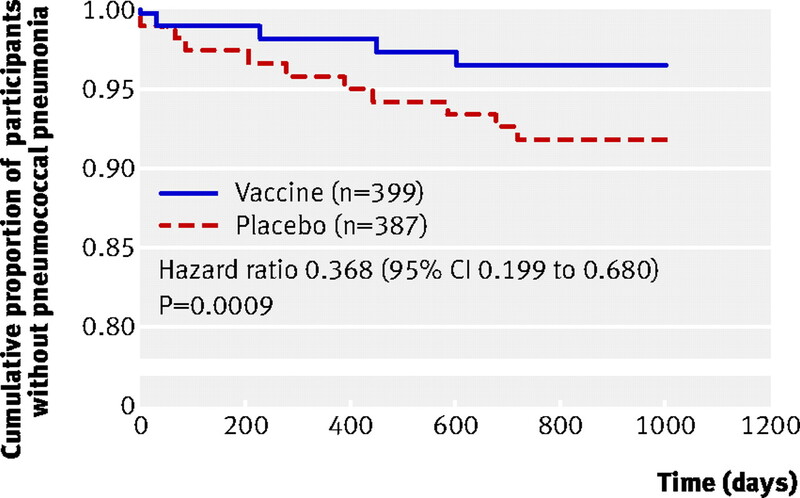 Among participants with all cause pneumonia, 20.6% (13/63) died in the vaccine group compared with 25.0% (26/104) in the placebo group. 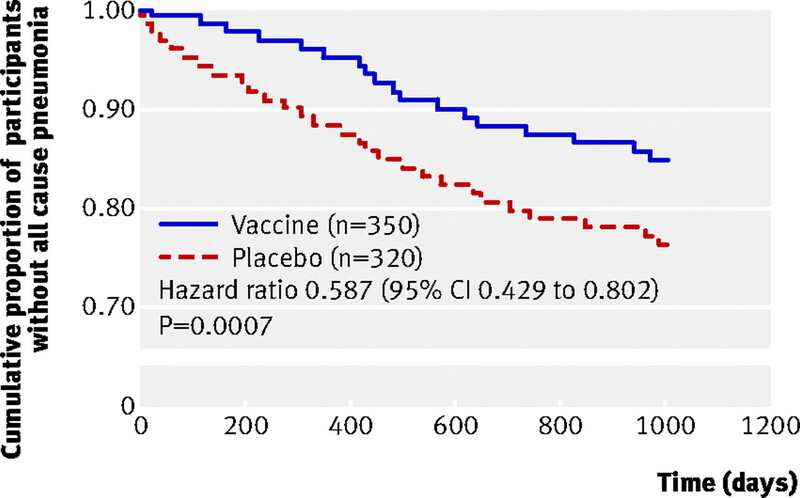 Among participants with non-pneumococcal pneumonia, 26.5% (13/49) died in the vaccine group compared with 19.4% (13/67) in the placebo group (table 3). Overall, 89 participants in the vaccine group and 80 in the placebo group died from all causes—for example, pneumonia, cerebrovascular disease, ischaemic cardiomyopathy, renal failure, senility, and others. Deaths from all causes did not differ between the groups (fig 4⇓). The 23-valent pneumococcal polysaccharide vaccine significantly prevented pneumococcal pneumonia and reduced the death rate from pneumococcal pneumonia in nursing home residents. To the best of our knowledge, this is the first randomised controlled trial to show the efficacy of the 23-valent vaccine. We originally hypothesised that the vaccine would be effective only against pneumococcal pneumonia and not all cause pneumonia. However, even though all cause pneumonia and pneumococcal pneumonia were significantly more common in the placebo group than vaccine group, the death rates from all cause pneumonia and non-pneumococcal pneumonia and the incidence of non-pneumococcal pneumonia were not significantly reduced in the vaccine group. In the present study pneumonia occurred in 72.8 cases per 1000 person years (167 cases/1006 people/2.28 years). The close follow-up of the population by the nursing staff of the homes, the frequent rounds by the doctors, and periodic visits by the study coordinator may explain the apparently high incidence of pneumonia in our study; however, the incidence is within the rate (33 to 114 cases per 1000 population per year) previously reported in nursing home residents.1 One study reported functional disability or malnutrition as main risk factors for pneumonia.19 Consistent with this, our participants exhibited a poor performance status (European Cooperative Oncology Group), malnutrition, and a high incidence of chronic underlying diseases. The participants in this study were at high risk of pneumococcal pneumonia. A sensitive and specific urinary antigen test was used to determine the efficacy of the vaccine. Intervention in patients with a high prevalence (22.2 per 1000 person years) of pneumococcal pneumonia and the use of a sensitive and specific diagnostic method were important factors in showing the efficacy of the vaccine. The use of specimens from non-sterile sites may affect the accuracy of a test for identifying causative organisms; thus, even though we used strict criteria for determining the causes, one of the limitations of the current study was the use of sputum and urine to diagnose pneumococcal pneumonia. Future studies need to confirm the efficacy of the 23-valent pneumococcal vaccine using only specimens from sterile sites. Another limitation of this study was that antibody responses to vaccination were not measured and correlated with clinical outcomes. Because of a steadily increasing elderly population in developed countries, nursing homes are often overcrowded. The incidence of infectious diseases such as pneumococcal pneumonia is common in elderly people because of their impaired host defence mechanisms. The rate of sporadic pneumococcal diseases among nursing home residents is almost 14 times as high as that among elderly people living in the community.25 In all of the reported nursing home outbreaks, less than 5% of the residents had reportedly been vaccinated.5 6 7 The efficacy of the 23-valent pneumococcal vaccine was reported against one outbreak of multidrug resistant pneumococcal infection in nursing homes in Oklahoma.5 No additional cases of pneumonia occurred and the rates of carriage decreased substantially after residents received the vaccine.5 Our findings, together with these previous reports, suggest the importance of vaccinating residents of nursing homes. Because of the increase in the elderly population, a progressive increase in the incidence of pneumonia can also be predicted in elderly people living in the community; future investigations should focus on the efficacy of the 23-valent pneumococcal vaccine in this population. The Ministry of Health, Labour and Welfare of Japan have not produced any official recommendation to immunise nursing home residents using 23-valent pneumococcal polysaccharide vaccine. The main reason for this is the lack of a randomised and prospective study on the efficacy of the vaccine. The results of the present trial show the preventive effect of the vaccine on pneumococcal pneumonia in nursing home residents in Japan. This finding suggests the need for a national policy that recommends the systematic vaccination of residents living in institutions to reduce morbidity as well as the cost of health care in Japan. We thank Hirokazu Toyoshima, Tomu Nakagawa, Takashi Kitade, Minori Itou, Tsutomu Sekoguchi, Naoyuki Nakase, Hiroshi Wada, Takashi Matsumoto, Suzue Kinoshita, Miho kijima, Chisato Yamamoto Kiichi Hine, Yoshiaki Nagai, Hideyo Yamamoto, Kyoko Nishida, Hiroko Uemoto, Mie Nakamura, Ikuyo Shiroyama, Mikako Matsuda, Yumi Shimizu, Fujiko Onishi, Keiko Sugioka, Emiko Funahashi, Takae Nishi, Shigeyo Hiraga, Kazuko Nakamura, Mariko Imai, Setsuko Takagaido, Kazumi Nakagawa, and Minako Hagino. Contributors: TM, OT, and ECG designed the study. TM and HK coordinated the conduct of the study. CD’A-G collected the samples and data. TK, SK, KN, SN, KN, and TN coordinated the recruitment of participants and collection of samples. YT, OT, ECG, JM, and MSN interpreted the findings. TM, ECG, and JM drafted the paper. TM and ECG are the guarantors. Funding: This study was funded by a grant in aid from the Ministry of Education, Culture, Sports, Science and Technology of Japan. The funder had no role in study design, data collection, data analysis, data interpretation, or writing of the manuscript. TM and ECG had full access to all the data and had final responsibility for the decision to publish the paper. Ethical approval: This study was approved by the ethical committee at each participating institution. Janssens JP, Krause KH. Pneumonia in the very old. Lancet Infect Dis2004;4:112-24. Maruyama T, Niederman MS, Kobayashi T, Kobayashi H, Takagi T, D’Alessandro-Gabazza CN, et al. A prospective comparison of nursing home-acquired pneumonia with hospital-acquired pneumonia in non-intubated elderly. Respir Med2008;102:1287-95. Lim WS, Macfarlane JT. A prospective comparison of nursing home acquired pneumonia with community acquired pneumonia. Eur Respir J2001;18:362-8. Tan CG, Ostrawski S, Bresnitz EA. A preventable outbreak of pneumococcal pneumonia among unvaccinated nursing home residents in New Jersey during 2001. Infect Control Hosp Epidemiol2003;24:848-52. Nuorti JP, Butler JC, Crutcher JM, Guevara R, Welch D, Holder P, et al. An outbreak of multidrug-resistant pneumococcal pneumonia and bacteremia among unvaccinated nursing home residents. N Engl J Med1998;338:1861-8. Quick RE, Hoge CW, Hamilton DJ, Whitney CJ, Borges M, Kobayashi JM. Underutilization of pneumococcal vaccine in nursing home in Washington State: report of a serotype-specific outbreak and a survey. Am J Med1993;94:149-52. Outbreaks of pneumococcal pneumonia among unvaccinated residents of chronic-care facilities—Massachusetts, October 1995; Oklahoma, February, 1996; and Maryland, May-June 1996. MMWR Morb Mortal Wkly Rep1997;46:60-2. Centers for Disease Control and Prevention. Prevention of pneumococcal disease: recommendations of the Advisory Committee on Immunization Practices (ACIP). MMWR Morb Mortal Wkly Rep1997;46:1-24. Jackson L, Neuzil K, Yu O, Benson P, Barlow W, Adams A, et al. Effectiveness of pneumococcal polysaccharide vaccine in older adults. N Engl J Med2003;348:1747-55. Dominguez A, Salleras L, Fedson D, Izquierdo C, Ruiz L, Ciruela P, et al. Effectiveness of pneumococcal vaccination for elderly people in Catalonia, Spain: a case control study. Clin Infect Dis2005;40:1250-7. Shapiro ED, Berg AT, Austrian R, Schroeder D, Parcells V, Margolis A, et al. The protective efficacy of polyvalent pneumococcal polysaccharide vaccine. N Engl J Med1991;325:1453-60. Sims R, Steinmann W, McConville M, King L, Zwick W, Scwartz S. The clinical effectiveness of pneumococcal vaccine in the elderly. Ann Intern Med1988;108:653-7. Moberley S, Holden J, Tatham DP, Andrews RM. Vaccines for preventing pneumococcal infection in adults. Cochrane Database Syst Rev2008;(1):CD000422. De Roux A, Lode H. Pneumococcal vaccination. Eur Respir J2005;26:982-3. Spika JS, Fedson DS, Facklam RR. Pneumococcal vaccination. Controversies and opportunities. Infect Dis Clin North Am1990;4:11-27. Marcos MA, Jimenez de Anta MT, de la Bellacasa JP, Gonzalez J, Martinez E, Garcia E, et al. Rapid urinary antigen test for diagnosis of pneumococcal community-acquired pneumonia in adults. Eur Respir J 2003;21:209-14. Kaufman P. Pneumonia in old age. Arch Intern Med1947;79:518-31. Gaillat J, Zmirou D, Mallaret MR, Rouhan D, Bru JP, Stahl JP, et al. Clinical trial of an anti-pneumococcal vaccine in elderly people living in institutions. Revue d’Epidemiologie et de Sante Publique1985;33:437-44. Muder RR. Pneumonia in residents of long-term care facilities: epidemiology, etiology, management, and prevention. Am J Med1998;105:319-30. Johnstone J, Marrie TJ, Eurich DT, Majumdar SR. Effect of pneumococcal vaccination in hospitalized adults with community-acquired pneumonia. Arch Intern Med2007;167:1938-43. Christenson B, Hedlund J, Lundbergh P, Ortqvist A. Additive preventive effect of influenza and pneumococcal vaccines in elderly persons. Eur Respir J2004;23:363-8. Ortqvist A, Hedlund J, Burman LA, Elbel E, Hofer M, Leinonen M, et al. Randomised trial of 23-valent pneumococcal capsular polysaccharide vaccine in prevention of pneumonia in middle-aged and elderly people. Swedish Pneumococcal Vaccination Study Group. Lancet1998;351:399-403. Musher DM, Mediwala R, Phan HM, Chen G, Baughn RE. Nonspecificity of assaying for IgG antibody to pneumolysin in circulating immune complexes as a means to diagnose pneumococcal pneumonia. Clin Infect Dis2001;32:534-8. French N, Nakiyingi J, Carpenter LM, Lugada E, Watera C, Moi K, et al. 23-valent pneumococcal polysaccharide vaccine in HIV-1-infected Ugandan adults: double-blind, randomised and placebo controlled trial. Lancet2000;355:2106-11. Haglund LA, Istre GR, Pickett DA, Welch DF, Fine DP. Invasive pneumococcal disease in central Oklahoma: emergence of high-level penicillin resistance and multiple antibiotic resistance. Pneumococcus Study Group. J Infect Dis1993;168:1532-6.